With his loving family by his side, Nicholas J. 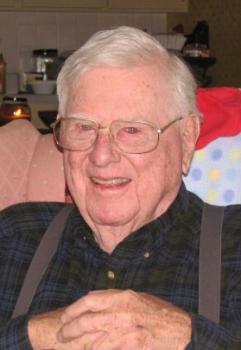 Wall, 90, of Marion made the final turn for “home” on Tuesday, November 13, 2018. He crossed the finish line of this life with flying colors and what a great run! Nick was born on May 9, 1928 to Lester E. and Hester (Kuntz) Wall in Richwood. He attended Richwood High School and was a member of the graduating class of ‘46. He was a fierce competitor in the classroom and in athletics where he finished at the top of his class and held the single game scoring record in both basketball and football. After high school, Nick attended The Ohio State University. He returned to Richwood in 1949 to run the family business, the Richwood Lumber Co. In the 1950s and ‘60s, he partnered with contractor Frank Postell and together they built many of the finer homes in Marion. In 1949, Nick married his high school sweetheart and the love of his life Dottie (Cheney), surviving. They would have celebrated their 70th wedding anniversary in May. Flush or thin, high or low, they were lovingly devoted to each other for life. Nick and his brother, Bill Wall founded Wall Bros Stable in the late ‘50s and raced harness horses primarily in the Chicago area. In the early 70s, he teamed up with world champion trainer/driver Joe Marsh, Jr. and raced world-class horses such as “Jefferson” and “Ajax” but his favorite horse was an old trotter by the name of Mudge Demon. He started him 84 times and he never made a break. Although he remained in harness racing for the remainder of his life, he became a licensed Realtor in 1974 and formed Wall Real Estate in 1976. Nick was a successful farm Broker until his retirement in the early 1990s. During his lifetime as a businessman, he didn’t turn his best friends into customers; he turned his customers into best friends. Nick loved to fish and enjoyed taking his friends perch and walleye fishing at Lake Erie and Escanaba, MI. His greatest fishing feat was the first and only time he went deep sea fishing and reeled in a 9 ½ foot, 165 lb. blue marlin off the coast of Ft. Lauderdale, but his greatest “catch” was Dottie. Nick was also an avid golfer and enjoyed golfing with his buddies at Kings Mill where he was known to have made a bet or two. ☺ He aced the 2nd hole at Marion Country Club and eagled the 3rd. After he retired, he and Dottie sold their winter home in Florida so that he could proudly watch and sideline “coach” his grandkids in all their sporting events. He was, by far, their biggest fan! Besides his loving and devoted wife, Dottie, Nick is survived by his sons Charlie (Myrna) and Nick (Jody) both of Marion and Joe (Kelli) of West Liberty and daughter Julie (Jeff) Robinson of Marysville, a very dear brother Dr. Lester Wall, St. Simons Island, Ga and a sister Anabel Sult, Miami Springs, FL. Also surviving are many nieces and nephews he loved very much. He was preceded in death by a brother, William K. Wall and a sister, Rosemary Taylor. He will be greatly missed by his grandchildren of whom he was so proud, Jesse Wall, Bart Wall, Bret Wall, Nick Wall, Ashley Thompson, Erin Russo, Hailey Rorie, McKenzie Price, Trent Phipps, Brooke Vermillion, Haden Wall, and Paityn Wall and 15 great grandchildren. Funeral Services will be Monday, November 19, 2018 at 11:00 AM at the Richwood First United Methodist Church with Pastor Joe Rhea officiating. Burial will follow in Claibourne Cemetery. Friends may call on Sunday from 2 to 5 PM at the Stofcheck-Ballinger Funeral Home, Richwood. Memorial gifts may be made to the First United Methodist Church, 18 S. Fulton Street, Richwood, OH 43344, St. Jude Children’s Research Hospital, 262 Danny Thomas Place, Memphis, TN 38105 (www.stjude.org), and the Standardbred Retirement Foundation, 42 Arneytown-Hornerstown Road, Cream Ridge, NJ 08514. Our thoughts & prayers are with you all. We are so sorry for your loss. Many people were touched by knowing Nick and the family. Dave and I wish to send our prayers and condolences. I am so sorry for your loss. Sending thoughts and prayers. We are so sorry to hear of Nick's passing. He had a great life and lived it fully, he was a great man and will be greatly missed by all who knew and loved him. May God wrap His arms around you and give you all His peace and comfort in the days ahead. Nick and Dottie were both students of my Mother, Martha Parrott. Remember them well. Mother was in her early teaching years and scared. Both treated her kindly. I'm so sorry for your loss. The Walls and the Rayls were like one big family over the years, and our parents had the kind of friendship any of us would hope for. I will always remember the many stories of our dads and their trips to Chicago (or anywhere), and what great times they had. Please accept our heartfelt sympathies. May all your wonderful memories help you thru this time of grief. Charlie and Nick, I am so sorry to hear of your Dad’s passing. Please know that you both and your family is in my prayers. Julie and family, I'm so sorry for your loss. Sending prayers to you all. Such a fitting and well written tribute to Nick that brought a smile to our face today. Prayer's to you all in remembrance of the lives that were touched. It is an honor to have known him. Prayers to the family. I remember Nick when I had the opportunity to play basketball with Erin, Ashley and Hailey in highschool. I could always hear two voices in the stands no matter how hard I tried to drown them out. Nick and my Grandma Yvonne were always the loudest in the stands. If you did something great you knew it. However, if you did something wrong...you really knew it! He will be missed. Love, hugs and prayers to all of you. With saddened hearts we offer our thoughts and prayers at this difficult time. Sincere sympathy to the Wall family. It certainly sounds like a life lived to the fullest and surrounded by love. We would like to extend our deepest sympathy to you all. Nick touched many lives through out his lifetime. May the peace of God be with you all in the days ahead. I am so sorry to hear of the death of my dear friend, Nick. What fond memories I have of times with him and Dotti and their children. Loosing long time friends always leaves a void and he will surely be missed. My condolences go to his entire family. My sympathy to the family during this time of loss.May the Wonderful Memories and friends help see you through this rough time. I'm so sorry to hear of Nick's passing, he was always so friendly and Otto and I enjoyed having Dottie and Nick as neighbors on Grindell Rd. Keeping all of you in prayer at this difficult time!! Sorry for your loss. Your family is in my thoughts and prayers. I am sorry for your loss may he rest in peace.You family has my prayers. You have our deepest sympathy! Please know that you have our heartfelt sympathy and prayers. I am so sorry to hear of your father's death. I will always remember his laugh and smile in those pinochle and poker games. He was a special man. Nick, I was very sorry to read about your father's passing. I want to send my condolences to your family for your loss. I am so sorry to hear of the loss of Nick. He is another larger-than-life community pillar that has been instrumental in many Richwood community projects. He has left many people with wonderful memories. Through your family and friends, may the consoling arms of God enfold you, God's love flow over you, and the compassionate heart of God fill yours with peace. May God be with all of you at this sad time. My thoughts and prayers are with you. SO SORRY TO HEAR OF YOUR LOSS OF NICK. I REMEMBER HIM WELL FROM HIGH SCHOOL DAYS IN RICHWOOD. My deepest sympathy to you and your family on the passing of your father. From reading his obituary, it sounds like he lived a good and fulfilling life. He will be missed. I am sorry for your loss. My thoughts and prayers to each of you. What a full life Mr. Wall lived and he will be missed by many. You are all in my heart and in my thoughts. Sending you our love from Florida. Wish we were there, together with you, to celebrate the wonderful life of Uncle Nick. Roya and the Djahanshahi Family. What a great guy. I feel for all of you. May God’s peace be with you. Sending our Sympathy and Love .